All Rights of Way are the responsibility of the Recreation Department of Hampshire County Council. In Ellisfield, the County Council delegated maintenance work of the paths to a small group of volunteers under the Hampshire Paths Partnership but this has now ceased. Anyone who has spent time looking at an Ordnance Survey map can't fail to be intrigued at the history behind those green coloured lines crisscrossing the countryside. Rights of Way connecting Church to Inn are easily understood but when a path seems to start and end in the middle of nowhere - that's when it gets interesting! “Alley Lane" is a bridleway starting beside the Memorial Hall (Church Lane) and ending up just before the old Basingstoke to Alton railway line. Walk a little further north east and you'll come out at the A339. “Winslade Lane" is a byway which joins the top of "Alley Lane" and heads south to the Bushywarren Lane and College Lane corner. "Duck's Alley" is a byway connecting Bushywarren Lane to Bell Lane. At the bottom of Church Lane is the footpath heading south east out to Herriard Grange. 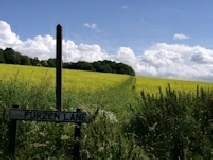 The footpath which connects the corner of Furzen Lane and Church Lane with the top of Bell Lane (see picture above left). "Kit Lane", a byway running almost due south from Bell Lane all the way down to the Axford Road. There is then a connection to the new Bradley bridleway which takes you along the side of Preston Oak Hills. Running between Lower Common (starting a little up Furzen Lane) and College Lane there is the "Zig-Zag". This footpath follows the line of hedgerows which are no longer there! Our smallest right of way, this is the first 600 yards of the bridleway starting at Wellclose Gate on the Berrydown Lane and heading almost due north to Farleigh Wallop. This section is in Ellisfield, the rest is in Nutley. There is the Pub to Church footpath. All the old stiles were replaced with kissing gates, installed by the volunteers of the Ellisfield Footpath Group (now disbanded!). They also built the steps opposite the Fox. If you want to go to Bedlam, head north west on the footpath which starts a few hundred yards up from the Fox Inn. Finally, if you like cows, there is the footpath from Hill Farm (Green Lane) to St Martin’s Church (Church Lane). 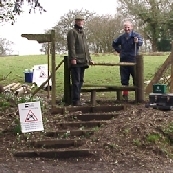 Picture on right shows volunteers Paul Turner and Peter Hopwood (with Ted Dowson who was behind the camera) installing steps and gate opposite the Church entrance. If you want further information or if you want to report any problems, please talk to the Clerk (or any councillor) of Ellisfield Parish Council (contact details HERE) or to this website’s editor, Paul Turner (contact details can be found at the foot of every page). The lower half of the Kit Lane byway (which runs from Bell Lane down to the Axford Road) has become very rutted (click on picture to display a larger image) and in a number of places it’s very hard to walk on, and impossible for two people to walk side by side. It looks as though there were two causes. 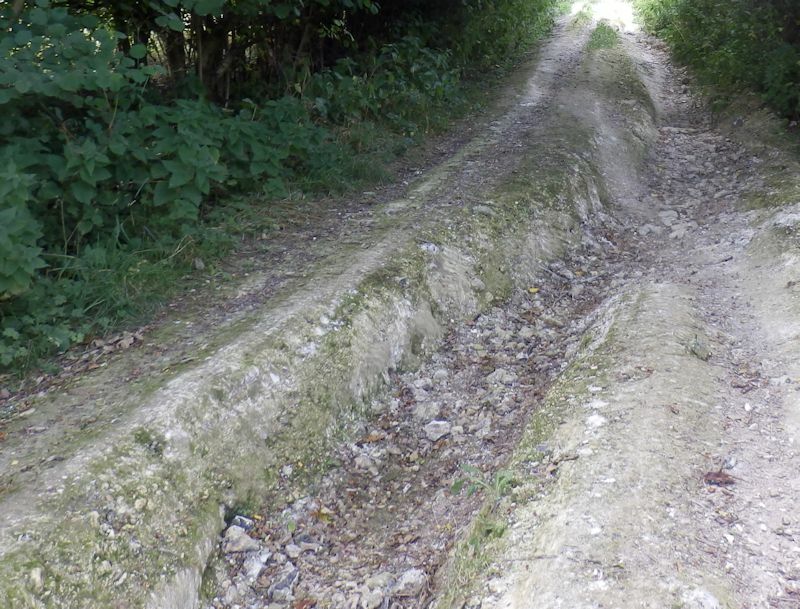 The first is that because it is a byway (strictly speaking it’s a “BOAT”, that is a Byway Open to All Traffic) motorbikes and 4x4s have churned up the top layer of soil, exposing the flint core. Then, secondly, rainwater has carried flints and large stones downhill, thus creating the deep ruts. Andrew Aitken, our area’s Senior Countryside Access Ranger of the Hampshire Countryside Service, last week walked Kit Lane and agreed that the condition of this byway deserved further investigation, especially as Kit Lane is an important section of the “3 Castles Path” (see News Item below). A new edition of the 3 Castles Path booklet has just been published and is available from Amazon UK for £7.99. This booklet uses maps, text and photos to fully describe a 60 mile route from Windsor to Winchester, via Odiham and Ellisfield, using mainly Rights of Way paths and byways. There is also a new 3 Castles Path website. The Ellisfield section starts at the A339, down the “Alley Lane” path which comes out beside the Memorial Hall. It then takes the path from the corner of Furzen Lane to College Lane, then down Bell Lane and then turns right down the Kit Lane byway (see NEWS ITEM above) to the Axford Road. It then leaves Ellisfield, taking the permissive path on the opposite side of the road and then on to Bradley. T wo kissing gates were installed on July 14 and 15 on the ZigZag path, to replace the existing stiles. Walkers who find stiles difficult to climb or those with dogs can now cross the fenced College Farm paddock with ease. Many thanks to Adrian de Ferranti for giving his permission. Also a grateful thanks to Andrew Aitkken (Senior Countryside Access Ranger of Hampshire County Council’s “Countryside Service”) for arranging the supply of the two gates. The picture (see right) is of the gate being installed at the College Lane end by Mitch Webb and Beth Webber of the Countryside Service’s installation team.